Amount of water:Low temperature slows down metabolic reactionsHigh temperature can cause proteins to denature, causing damage to enzymes and to cell membrane. TemperatureLow temperature = slow down metabolic reactionHigh temperature = cause protein to denatureE.g. Cell membrane and enzymes. Principles of homeostatis:The ability to control core temperature.Whatever temperature of he environment outside the body, the cells within it are kept at a temperature close to 37 degrees. 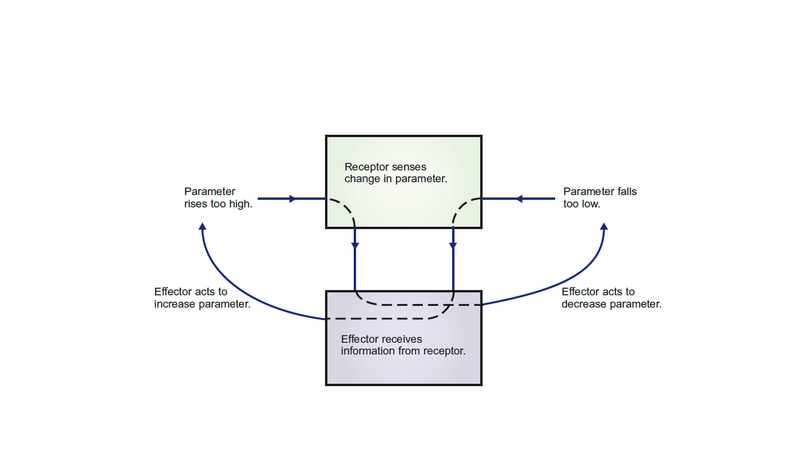 A negative feedback system requires a receptor and an effector and good communication between the two. On the other hand, there's positive feedback !Meaning:Positive feedback pushes a parameter further and further away from the norm, rather than keeping it constant.E.g. Person breathes in air with high concen. of carbon dioxide, producing high concen. of CO2 in blood and therefore increasing breathing rate. Conduction: Heat passes from one particle to another if they are next to each other. The speed of transfer depends on how good the conductor is. All mammals are able to generate heat within their bodies and so are said to be endothermic,Body temperature is controlled by ensuring a balance between heat input and outputIf external temperature rises above our internal, the only way to keep cool is via sweat. Output:-Radiation from the body-Conduction to colder substances-Conduction and convection in sweating. Temperature receptorsThe hypothalamus receives information about temperature from other sources as well. 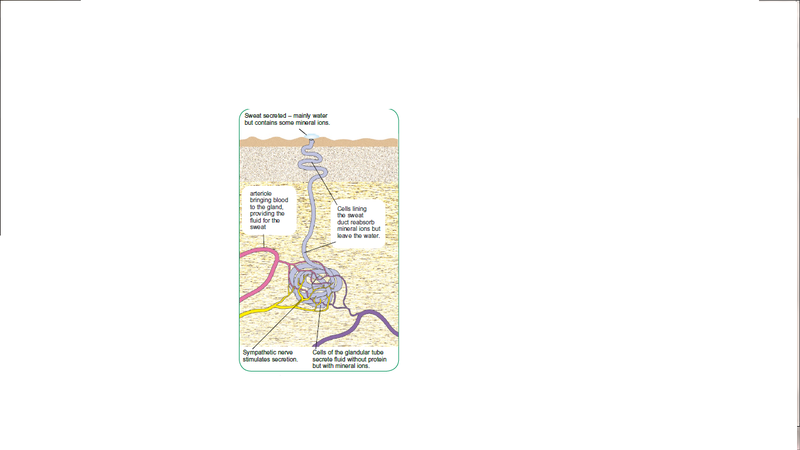 The skin contains receptors that monitor the changes in skin temperature which is the first to change if there's a change in enviromentHence, these peripheral (around the outside) receptors are able to give 'early' warnings about a possible change in temperature. 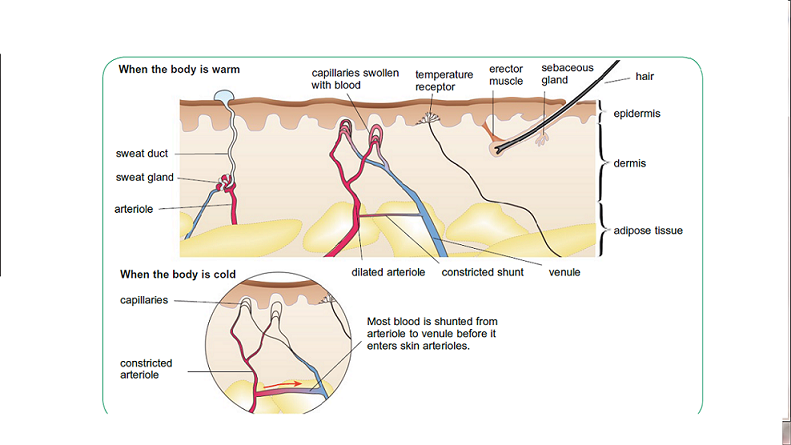 E.g When you walk from a warm room into a cold one and 'feel cold' it is nerve impulses from these peripheral temperature receptors in your skin that you are responding to, Hence, no change in core temperature. Behaviour can help too!We tend to wear fewer clothes on a hot day, we move into the shade . We drink iced drink and eat cool salads instead of hot food. Hypothermia is a condition which the body temperature drops significantly below normal and the body can't regulate the temperatureCan be caused by extreme cold or people who are unwilling to spend money on heating.Hypothermia causes the body cells to slow down metabolic reactions and one who suffers it will feel sleepy and relaxed.Sugary drinks should not be given because the body won't be able to metabolise sugar if they're too cold.However, heart surgery needs the state of hypothermia. The heart will stop beating but yet slow down the metabolic rate of the cells, causing the person to still be alive. This avoids the use of a heart-lung machine to keep oxygenated blood moving to the body cells during the operation.